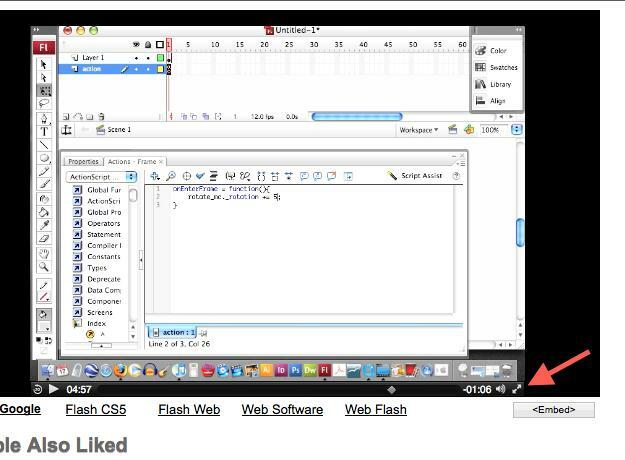 This clip demonstrates an easy way to make an object rotate using Flash ActionScript. Whether you're new to Adobe's popular Flash-development platform or a seasoned web developer looking to better acquaint yourself with the new features and functions of the latest iteration of the application, you're sure to benefit from this free software tutorial. For more information, and to get started rotating elements with ActionScript in your own Adobe Flash projects, watch this video guide. Can't read the actionscript - and there's no way to maximise the video to make it bigger so I CAN read it. Wow - a great help. After the .mov files loads, there should be a little two-sided arrow in the bottom-right of the player (click here to see what it looks like). Click on that and it will expand the video to full screen mode where you can read the script.